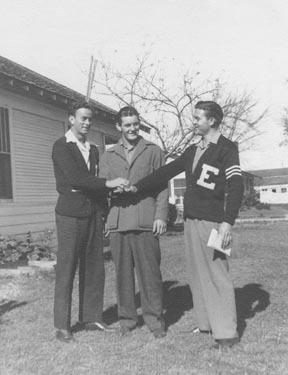 Best friends, left to right, were James Wesley "Airdale" Goodwin, Joe Riley "Joe" Crow and William Thomas "Dooney" Pierce, Jr. After a farewell party given by Dooney's mother, the trio was on their way to Dallas, Texas to join the U.S. Marine Corps Reserve on December 1, 1942 for the "Duration of the National Emergency," and board a Pullman car for the first leg of their journey to basic training in San Diego, California. They would, be assigned service numbers in sequence; volunteer for Parachute Training School; be assigned to the new 5th Marine Division, with Airdale assigned to Company C, 1st Battalion, 26th Marines, Dooney to Company C, 1st Battalion, 27th Marines and Joe to Company G, 3rd Battalion, 28th Marines; land in the assault against Iwo Jima , the largest and most important island in the three island group making up the Volcano Islands, on February 19, 1945; and their lives would stop in order of Crow, Goodwin and Pierce within the first 23 days of fighting in the "Battle for Iwo Jima," a foul smelling, gourd shaped, eight square mile island exposed to the full force of the vast northwestern Pacific Ocean. Airdale was 21, and Joe and Dooney were 20.